The Toyota Prius is the world's top selling hybrid electric vehicle, with global sales of almost 4 million units through January 2017. A Brazilian filling station with four alternative fuels for sale: biodiesel (B3), gasohol (E25), neat ethanol (E100), and compressed natural gas (CNG). The Chevrolet Volt family is the world's top selling plug-in hybrid, with global sales of about 134,500 units as of December 2016[update]. An alternative fuel vehicle is a vehicle that runs on a fuel other than traditional petroleum fuels (petrol or Diesel fuel); and also refers to any technology of powering an engine that does not involve solely petroleum (e.g. electric car, hybrid electric vehicles, solar powered). Because of a combination of factors, such as environmental concerns, high oil prices and the potential for peak oil, development of cleaner alternative fuels and advanced power systems for vehicles has become a high priority for many governments and vehicle manufacturers around the world. An environmental analysis extends beyond just the operating efficiency and emissions. A life-cycle assessment of a vehicle involves production and post-use considerations. A cradle-to-cradle design is more important than a focus on a single factor such as the type of fuel. Brazil is the world's leader in flexible-fuel car sales, with cumulative sales totalling 25.5 million units as of June 2015[update] . About 55 million flex fuel automobiles, motorcycles and light duty trucks manufactured and sold worldwide by mid 2015, led by Brazil with 29.5 million by mid 2015, followed by the United States with 17.4 million by the end of 2014, Canada with about 1.6 million by 2014, and Sweden with 243,100 through December 2014. The Brazilian flex fuel fleet includes over 4 million flexible-fuel motorcycles produced since 2009 through March 2015. 22.7 million natural gas vehicles as of August 2015[update], led by China (4.4 million) Iran with 4.00 million, followed by Pakistan (3.70 million), Argentina (2.48 million), India (1.80 million) and Brazil (1.78 million). 24.9 million LPG powered vehicles by December 2013, led by Turkey with 3.93 million, South Korea (2.4 million), and Poland (2.75 million). More than 12 million hybrid electric vehicles have been sold worldwide. As of April 2016[update], Japan ranked as the market leader with more than 5 million hybrids sold, followed by the United States with cumulative sales of over 4 million units since 1999, and Europe with about 1.5 million hybrids delivered since 2000. As of January 2017[update], global sales are by Toyota Motor Company with more than 10 million Lexus and Toyota hybrids sold, followed by Honda Motor Co., Ltd. with cumulative global sales of more than 1.35 million hybrids as of June 2014[update]. As of January 2017[update], global hybrid sales are led by the Prius family, with cumulative sales of 6.1 million units. The Toyota Prius liftback is the world's top selling hybrid electric car with cumulative sales of 3.985 million units through January 2017. 5.7 million neat-ethanol only light-vehicles built in Brazil since 1979, with 2.4 to 3.0 million vehicles still in use by 2003. and 1.22 million units as of December 2011. The Tesla Model S all-electric car is the world's second best-selling plug-in electric car with more than 150,000 units sold as of December 2016[update]. More than 4 million highway-legal plug-in electric passenger cars and light utility vehicles had been sold worldwide at the end of September 2018. Cumulative global sales of all-electric cars and vans passed the 1 million unit milestone in September 2016. As of September 2018[update], the Nissan Leaf is the world's all-time top selling highway-capable plug-in electric car, with global sales of over 350,000 units since its inception. As of December 2016[update], ranking second was the all-electric Tesla Model S with about over 158,000 units, followed by the Chevrolet Volt plug-in hybrid, which together with its sibling the Opel/Vauxhall Ampera has combined global sales of about 134,500 units, and the Mitsubishi Outlander P-HEV, with global sales of about 119,500 units. As of September 2018[update], China has the world's largest stock of highway legal plug-in electric passenger cars with cumulative sales of almost 2 million units. Among country markets, the United States ranks second with 1 million plug-in electric cars sold through September 2018.Cumulative sales of highway legal plug-in electric cars and vans in Europe achieved the one million unit milestone in June 2018. As of September 2018[update], sales in the European light-duty plug-in electric segment are led by Norway with almost 275,000 units registered. China is the world's leader in the plug-in heavy-duty segment, including electric all-electric buses, and plug-in commercial and sanitation trucks. The stock of new energy vehicles sold in China totaled 2.21 million units up until September 2018. As of December 2015[update], China was the world's largest plug-in electric bus market with a stock of almost 173,000 vehicles. The air engine is an emission-free piston engine that uses compressed air as a source of energy. The first compressed air car was invented by a French engineer named Guy Nègre. The expansion of compressed air may be used to drive the pistons in a modified piston engine. Efficiency of operation is gained through the use of environmental heat at normal temperature to warm the otherwise cold expanded air from the storage tank. This non-adiabatic expansion has the potential to greatly increase the efficiency of the machine. The only exhaust is cold air (−15 °C), which could also be used to air condition the car. The source for air is a pressurized carbon-fiber tank. Air is delivered to the engine via a rather conventional injection system. Unique crank design within the engine increases the time during which the air charge is warmed from ambient sources and a two-stage process allows improved heat transfer rates. Battery electric vehicles (BEVs), also known as all-electric vehicles (AEVs), are electric vehicles whose main energy storage is in the chemical energy of batteries. BEVs are the most common form of what is defined by the California Air Resources Board (CARB) as zero emission vehicle (ZEV) because they produce no tailpipe emissions at the point of operation. The electrical energy carried on board a BEV to power the motors is obtained from a variety of battery chemistries arranged into battery packs. For additional range genset trailers or pusher trailers are sometimes used, forming a type of hybrid vehicle. Batteries used in electric vehicles include "flooded" lead-acid, absorbed glass mat, NiCd, nickel metal hydride, Li-ion, Li-poly and zinc-air batteries. Attempts at building viable, modern battery-powered electric vehicles began in the 1950s with the introduction of the first modern (transistor controlled) electric car – the Henney Kilowatt, even though the concept was out in the market since 1890. Despite the poor sales of the early battery-powered vehicles, development of various battery-powered vehicles continued through the mid-1990s, with such models as the General Motors EV1 and the Toyota RAV4 EV. The Nissan Leaf is the world's top selling highway-capable all-electric car. The Leaf achieved the milestone of 250,000 units sold globally in December 2016. Battery powered cars had primarily used lead-acid batteries and NiMH batteries. Lead-acid batteries' recharge capacity is considerably reduced if they're discharged beyond 75% on a regular basis, making them a less-than-ideal solution. NiMH batteries are a better choice, but are considerably more expensive than lead-acid. Lithium-ion battery powered vehicles such as the Venturi Fetish and the Tesla Roadster have recently demonstrated excellent performance and range, and nevertheless is used in most mass production models launched since December 2010. As of December 2015[update], several neighborhood electric vehicles, city electric cars and series production highway-capable electric cars and utility vans have been made available for retails sales, including Tesla Roadster, GEM cars, Buddy, Mitsubishi i MiEV and its rebadged versions Peugeot iOn and Citroën C-Zero, Chery QQ3 EV, JAC J3 EV, Nissan Leaf, Smart ED, Mia electric, BYD e6, Renault Kangoo Z.E., Bolloré Bluecar, Renault Fluence Z.E., Ford Focus Electric, BMW ActiveE, Renault Twizy, Tesla Model S, Honda Fit EV, RAV4 EV second generation, Renault Zoe, Mitsubishi Minicab MiEV, Roewe E50, Chevrolet Spark EV, Fiat 500e, BMW i3, Volkswagen e-Up!, Nissan e-NV200, Volkswagen e-Golf, Mercedes-Benz B-Class Electric Drive, Kia Soul EV, BYD e5, and Tesla Model X. The world's all-time top selling highway legal electric car is the Nissan Leaf, released in December 2010, with global sales of more than 250,000 units through December 2016. 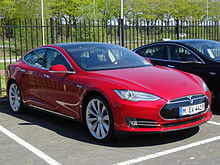 The Tesla Model S, released in June 2012, ranks second with global sales of over 158,000 cars delivered as of December 2016[update]. The Renault Kangoo Z.E. utility van is the leader of the light-duty all-electric segment with global sales of 25,205 units through December 2016. A solar car is an electric vehicle powered by solar energy obtained from solar panels on the car. Solar panels cannot currently be used to directly supply a car with a suitable amount of power at this time, but they can be used to extend the range of electric vehicles. They are raced in competitions such as the World Solar Challenge and the North American Solar Challenge. These events are often sponsored by Government agencies such as the United States Department of Energy keen to promote the development of alternative energy technology such as solar cells and electric vehicles. Such challenges are often entered by universities to develop their students engineering and technological skills as well as motor vehicle manufacturers such as GM and Honda. Trev's battery lasts over 250,000 kilometres. The North American Solar Challenge is a solar car race across North America. Originally called Sunrayce, organized and sponsored by General Motors in 1990, it was renamed American Solar Challenge in 2001, sponsored by the United States Department of Energy and the National Renewable Energy Laboratory. Teams from universities in the United States and Canada compete in a long distance test of endurance as well as efficiency, driving thousands of miles on regular highways. Nuna is the name of a series of manned solar powered vehicles that won the World solar challenge in Australia three times in a row, in 2001 (Nuna 1 or just Nuna), 2003 (Nuna 2) and 2005 (Nuna 3). The Nunas are built by students of the Delft University of Technology. The World solar challenge is a solar powered car race over 3,021 kilometres (1,877 mi) through central Australia from Darwin to Adelaide. The race attracts teams from around the world, most of which are fielded by universities or corporations although some are fielded by high schools. Trev (two-seater renewable energy vehicle) was designed by the staff and students at the University of South Australia. Trev was first displayed at the 2005 World Solar Challenge as the concept of a low-mass, efficient commuter car. With 3 wheels and a mass of about 300 kg, the prototype car had maximum speed of 120 km/h and acceleration of 0–100 km/h in about 10 seconds. The running cost of Trev is projected to be less than 1/10 of the running cost of a small petrol car. Dimethyl ether (DME) is a promising fuel in diesel engines, petrol engines (30% DME / 70% LPG), and gas turbines owing to its high cetane number, which is 55, compared to diesel's, which is 40–53. Only moderate modification are needed to convert a diesel engine to burn DME. The simplicity of this short carbon chain compound leads during combustion to very low emissions of particulate matter, NOx, CO. For these reasons as well as being sulfur-free, DME meets even the most stringent emission regulations in Europe (EURO5), U.S. (U.S. 2010), and Japan (2009 Japan). Mobil is using DME in their methanol to gasoline process. DME is being developed as a synthetic second generation biofuel (BioDME), which can be manufactured from lignocellulosic biomass. Currently the EU is considering BioDME in its potential biofuel mix in 2030; the Volvo Group is the coordinator for the European Community Seventh Framework Programme project BioDME where Chemrec's BioDME pilot plant based on black liquor gasification is nearing completion in Piteå, Sweden. Ammonia is produced by combining gaseous hydrogen with nitrogen from the air. Large-scale ammonia production uses natural gas for the source of hydrogen. Ammonia was used during World War II to power buses in Belgium, and in engine and solar energy applications prior to 1900. Liquid ammonia also fuelled the Reaction Motors XLR99 rocket engine, that powered the X-15 hypersonic research aircraft. Although not as powerful as other fuels, it left no soot in the reusable rocket engine and its density approximately matches the density of the oxidizer, liquid oxygen, which simplified the aircraft's design. Ammonia has been proposed as a practical alternative to fossil fuel for internal combustion engines. The calorific value of ammonia is 22.5 MJ/kg (9690 BTU/lb), which is about half that of diesel. In a normal engine, in which the water vapour is not condensed, the calorific value of ammonia will be about 21% less than this figure. It can be used in existing engines with only minor modifications to carburettors/injectors. If produced from coal, the CO2 can be readily sequestered (the combustion products are nitrogen and water). Ammonia engines or ammonia motors, using ammonia as a working fluid, have been proposed and occasionally used. The principle is similar to that used in a fireless locomotive, but with ammonia as the working fluid, instead of steam or compressed air. Ammonia engines were used experimentally in the 19th century by Goldsworthy Gurney in the UK and in streetcars in New Orleans. In 1981 a Canadian company converted a 1981 Chevrolet Impala to operate using ammonia as fuel. Ammonia and GreenNH3 is being used with success by developers in Canada, since it can run in spark ignited or diesel engines with minor modifications, also the only green fuel to power jet engines, and despite its toxicity is reckoned to be no more dangerous than petrol or LPG. It can be made from renewable electricity, and having half the density of petrol or diesel can be readily carried in sufficient quantities in vehicles. On complete combustion it has no emissions other than nitrogen and water vapour. The combustion chemical formula is 4 NH3 + 3 O2 → 2 N2 + 6 H2O, 75% water is the result. The Ford Model T was the first commercial flex-fuel vehicle. The engine was capable of running on gasoline or ethanol, or a mix of both. The 2003 VW Gol 1.6 Total Flex was the first commercial flexible-fuel vehicle in the Brazilian market, capable of running on any mixture of gasoline (E20 to E25 blend) and ethanol (E100). The first commercial vehicle that used ethanol as a fuel was the Ford Model T, produced from 1908 through 1927. It was fitted with a carburetor with adjustable jetting, allowing use of gasoline or ethanol, or a combination of both. Other car manufactures also provided engines for ethanol fuel use. In the United States, alcohol fuel was produced in corn-alcohol stills until Prohibition criminalized the production of alcohol in 1919. The use of alcohol as a fuel for internal combustion engines, either alone or in combination with other fuels, lapsed until the oil price shocks of the 1970s. Furthermore, additional attention was gained because of its possible environmental and long-term economical advantages over fossil fuel. Both ethanol and methanol have been used as an automotive fuel. While both can be obtained from petroleum or natural gas, ethanol has attracted more attention because it is considered a renewable resource, easily obtained from sugar or starch in crops and other agricultural produce such as grain, sugarcane, sugar beets or even lactose. Since ethanol occurs in nature whenever yeast happens to find a sugar solution such as overripe fruit, most organisms have evolved some tolerance to ethanol, whereas methanol is toxic. Other experiments involve butanol, which can also be produced by fermentation of plants. Support for ethanol comes from the fact that it is a biomass fuel, which addresses climate change and greenhouse gas emissions, though these benefits are now highly debated, including the heated 2008 food vs fuel debate. Most modern cars are designed to run on gasoline are capable of running with a blend from 10% up to 15% ethanol mixed into gasoline (E10-E15). With a small amount of redesign, gasoline-powered vehicles can run on ethanol concentrations as high as 85% (E85), the maximum set in the United States and Europe due to cold weather during the winter, or up to 100% (E100) in Brazil, with a warmer climate. Ethanol has close to 34% less energy per volume than gasoline, consequently fuel economy ratings with ethanol blends are significantly lower than with pure gasoline, but this lower energy content does not translate directly into a 34% reduction in mileage, because there are many other variables that affect the performance of a particular fuel in a particular engine, and also because ethanol has a higher octane rating which is beneficial to high compression ratio engines. For this reason, for pure or high ethanol blends to be attractive for users, its price must be lower than gasoline to offset the lower fuel economy. As a rule of thumb, Brazilian consumers are frequently advised by the local media to use more alcohol than gasoline in their mix only when ethanol prices are 30% lower or more than gasoline, as ethanol price fluctuates heavily depending on the results and seasonal harvests of sugar cane and by region. In the US, and based on EPA tests for all 2006 E85 models, the average fuel economy for E85 vehicles was found 25.56% lower than unleaded gasoline. The EPA-rated mileage of current American flex-fuel vehicles could be considered when making price comparisons, though E85 has octane rating of about 104 and could be used as a substitute for premium gasoline. Regional retail E85 prices vary widely across the US, with more favorable prices in the Midwest region, where most corn is grown and ethanol produced. In August 2008 the US average spread between the price of E85 and gasoline was 16.9%, while in Indiana was 35%, 30% in Minnesota and Wisconsin, 19% in Maryland, 12 to 15% in California, and just 3% in Utah. Depending of the vehicle capabilities, the break even price of E85 usually has to be between 25 and 30% lower than gasoline. E85 fuel sold at a regular gasoline station in Washington, D.C.. Reacting to the high price of oil and its growing dependence on imports, in 1975 Brazil launched the Pro-alcool program, a huge government-subsidized effort to manufacture ethanol fuel (from its sugar cane crop) and ethanol-powered automobiles. These ethanol-only vehicles were very popular in the 1980s, but became economically impractical when oil prices fell – and sugar prices rose – late in that decade. In May 2003 Volkswagen built for the first time a commercial ethanol flexible fuel car, the Gol 1.6 Total Flex. These vehicles were a commercial success and by early 2009 other nine Brazilian manufacturers are producing flexible fuel vehicles: Chevrolet, Fiat, Ford, Peugeot, Renault, Honda, Mitsubishi, Toyota, Citroën, and Nissan. The adoption of the flex technology was so rapid, that flexible fuel cars reached 87.6% of new car sales in July 2008. As of August 2008, the fleet of "flex" automobiles and light commercial vehicles had reached 6 million new vehicles sold, representing almost 19% of all registered light vehicles. The rapid success of "flex" vehicles, as they are popularly known, was made possible by the existence of 33,000 filling stations with at least one ethanol pump available by 2006, a heritage of the Pro-alcool program. In the United States, initial support to develop alternative fuels by the government was also a response to the 1973 oil crisis, and later on, as a goal to improve air quality. Also, liquid fuels were preferred over gaseous fuels not only because they have a better volumetric energy density but also because they were the most compatible fuels with existing distribution systems and engines, thus avoiding a big departure from the existing technologies and taking advantage of the vehicle and the refueling infrastructure. California led the search of sustainable alternatives with interest in methanol. In 1996, a new FFV Ford Taurus was developed, with models fully capable of running either methanol or ethanol blended with gasoline. This ethanol version of the Taurus was the first commercial production of an E85 FFV. The momentum of the FFV production programs at the American car companies continued, although by the end of the 90's, the emphasis was on the FFV E85 version, as it is today. Ethanol was preferred over methanol because there is a large support in the farming community and thanks to government's incentive programs and corn-based ethanol subsidies. Sweden also tested both the M85 and the E85 flexifuel vehicles, but due to agriculture policy, in the end emphasis was given to the ethanol flexifuel vehicles. Biodiesel (B20) pump in the U.S. The main benefit of Diesel combustion engines is that they have a 44% fuel burn efficiency; compared with just 25–30% in the best gasoline engines. In addition diesel fuel has slightly higher Energy Density by volume than gasoline. This makes Diesel engines capable of achieving much better fuel economy than gasoline vehicles. Biodiesel (Fatty acid methyl ester), is commercially available in most oilseed-producing states in the United States. As of 2005, it is somewhat more expensive than fossil diesel, though it is still commonly produced in relatively small quantities (in comparison to petroleum products and ethanol). Many farmers who raise oilseeds use a biodiesel blend in tractors and equipment as a matter of policy, to foster production of biodiesel and raise public awareness. It is sometimes easier to find biodiesel in rural areas than in cities. Biodiesel has lower Energy Density than fossil diesel fuel, so biodiesel vehicles are not quite able to keep up with the fuel economy of a fossil fuelled diesel vehicle, if the diesel injection system is not reset for the new fuel. If the injection timing is changed to take account of the higher Cetane value of biodiesel, the difference in economy is negligible. Because biodiesel contains more oxygen than diesel or vegetable oil fuel, it produces the lowest emissions from diesel engines, and is lower in most emissions than gasoline engines. Biodiesel has a higher lubricity than mineral diesel and is an additive in European pump diesel for lubricity and emissions reduction. Some Diesel-powered cars can run with minor modifications on 100% pure vegetable oils. Vegetable oils tend to thicken (or solidify if it is waste cooking oil), in cold weather conditions so vehicle modifications (a two tank system with diesel start/stop tank), are essential in order to heat the fuel prior to use under most circumstances. Heating to the temperature of engine coolant reduces fuel viscosity, to the range cited by injection system manufacturers, for systems prior to 'common rail' or 'unit injection ( VW PD)' systems. Waste vegetable oil, especially if it has been used for a long time, may become hydrogenated and have increased acidity. This can cause the thickening of fuel, gumming in the engine and acid damage of the fuel system. Biodiesel does not have this problem, because it is chemically processed to be PH neutral and lower viscosity. Modern low emission diesels (most often Euro -3 and -4 compliant), typical of the current production in the European industry, would require extensive modification of injector system, pumps and seals etc. due to the higher operating pressures, that are designed thinner (heated) mineral diesel than ever before, for atomisation, if they were to use pure vegetable oil as fuel. Vegetable oil fuel is not suitable for these vehicles as they are currently produced. This reduces the market as increasing numbers of new vehicles are not able to use it. However, the German Elsbett company has successfully produced single tank vegetable oil fuel systems for several decades, and has worked with Volkswagen on their TDI engines. This shows that it is technologically possible to use vegetable oil as a fuel in high efficiency / low emission diesel engines. Greasestock is an event held yearly in Yorktown Heights, New York, and is one of the largest showcases of vehicles using waste oil as a biofuel in the United States. Compressed Biogas may be used for Internal Combustion Engines after purification of the raw gas. The removal of H2O, H2S and particles can be seen as standard producing a gas which has the same quality as Compressed Natural Gas. The use of biogas is particularly interesting for climates where the waste heat of a biogas powered power plant cannot be used during the summer. In the 1930s Tang Zhongming made an invention using abundant charcoal resources for Chinese auto market. The Charcoal-fuelled car was later used intensively in China, serving the army and conveyancer after the breakout of World War II. The Brazilian Fiat Siena Tetrafuel 1.4, the first multifuel car that runs as a flexible-fuel on pure gasoline, or E25, or E100; or runs as a bi-fuel with natural gas (CNG). High-pressure compressed natural gas, mainly composed of methane, that is used to fuel normal combustion engines instead of gasoline. Combustion of methane produces the least amount of CO2 of all fossil fuels. Gasoline cars can be retrofitted to CNG and become bifuel Natural gas vehicles (NGVs) as the gasoline tank is kept. The driver can switch between CNG and gasoline during operation. Natural gas vehicles (NGVs) are popular in regions or countries where natural gas is abundant. Widespread use began in the Po River Valley of Italy, and later became very popular in New Zealand by the eighties, though its use has declined. Buses powered with CNG are common in the United States. As of December 2012[update], there were 17.8 million natural gas vehicles worldwide, led by Iran with 3.30 million, followed by Pakistan (2.79 million), Argentina (2.29 million), Brazil (1.75 million), China (1.58 million) and India (1.5 million). As of 2010, the Asia-Pacific region led the global market with a share of 54%. In Europe they are popular in Italy (730,000), Ukraine (200,000), Armenia (101,352), Russia (100,000) and Germany (91,500), and they are becoming more so as various manufacturers produce factory made cars, buses, vans and heavy vehicles. In the United States CNG powered buses are the favorite choice of several public transit agencies, with an estimated CNG bus fleet of some 130,000. Other countries where CNG-powered buses are popular include India, Australia, Argentina, and Germany. CNG vehicles are common in South America, where these vehicles are mainly used as taxicabs in main cities of Argentina and Brazil. Normally, standard gasoline vehicles are retrofitted in specialized shops, which involve installing the gas cylinder in the trunk and the CNG injection system and electronics. The Brazilian GNV fleet is concentrated in the cities of Rio de Janeiro and São Paulo. Pike Research reports that almost 90% of NGVs in Latin America have bi-fuel engines, allowing these vehicles to run on either gasoline or CNG. In 2006 the Brazilian subsidiary of FIAT introduced the Fiat Siena Tetra fuel, a four-fuel car developed under Magneti Marelli of Fiat Brazil. This automobile can run on 100% ethanol (E100), E25 (Brazil's normal ethanol gasoline blend), pure gasoline (not available in Brazil), and natural gas, and switches from the gasoline-ethanol blend to CNG automatically, depending on the power required by road conditions. Other existing option is to retrofit an ethanol flexible-fuel vehicle to add a natural gas tank and the corresponding injection system. Some taxicabs in São Paulo and Rio de Janeiro, Brazil, run on this option, allowing the user to choose among three fuels (E25, E100 and CNG) according to current market prices at the pump. Vehicles with this adaptation are known in Brazil as "tri-fuel" cars. HCNG or Hydrogen enriched Compressed Natural Gas for automobile use is premixed at the hydrogen station. Formic acid is used by converting it first to hydrogen, and using that in a fuel cell. Formic acid is much easier to store than hydrogen. The 2009 Honda FCX Clarity is a hydrogen fuel cell automobile launched to the market in 2008. Hydrogen fueling station in California. Sequel, a hydrogen fuel cell-powered vehicle from General Motors. The Hyundai ix35 FCEV was released for leasing in the U.S. in 2014. The Toyota Mirai is one of the first hydrogen fuel-cell vehicles to be sold commercially to retail customers, initially, only in Japan and California. A hydrogen car is an automobile which uses hydrogen as its primary source of power for locomotion. These cars generally use the hydrogen in one of two methods: combustion or fuel-cell conversion. In combustion, the hydrogen is "burned" in engines in fundamentally the same method as traditional gasoline cars. In fuel-cell conversion, the hydrogen is turned into electricity through fuel cells which then powers electric motors. With either method, the only byproduct from the spent hydrogen is water, however during combustion with air NOx can be produced. Honda introduced its fuel cell vehicle in 1999 called the FCX and have since then introduced the second generation FCX Clarity. Limited marketing of the FCX Clarity, based on the 2007 concept model, began in June 2008 in the United States, and it was introduced in Japan in November 2008. The FCX Clarity was available in the U.S. only in Los Angeles Area, where 16 hydrogen filling stations are available, and until July 2009, only 10 drivers have leased the Clarity for US$600 a month. At the 2012 World Hydrogen Energy Conference, Daimler AG, Honda, Hyundai and Toyota all confirmed plans to produce hydrogen fuel cell vehicles for sale by 2015, with some types planned to enter the showroom in 2013. From 2008 to 2014, Honda leased a total of 45 FCX units in the US. A small number of prototype hydrogen cars currently exist, and a significant amount of research is underway to make the technology more viable. The common internal combustion engine, usually fueled with gasoline (petrol) or diesel liquids, can be converted to run on gaseous hydrogen. However, the most efficient use of hydrogen involves the use of fuel cells and electric motors instead of a traditional engine. Hydrogen reacts with oxygen inside the fuel cells, which produces electricity to power the motors. One primary area of research is hydrogen storage, to try to increase the range of hydrogen vehicles while reducing the weight, energy consumption, and complexity of the storage systems. Two primary methods of storage are metal hydrides and compression. Some believe that hydrogen cars will never be economically viable and that the emphasis on this technology is a diversion from the development and popularization of more efficient hybrid cars and other alternative technologies. A study by The Carbon Trust for the UK Department of Energy and Climate Change suggests that hydrogen technologies have the potential to deliver UK transport with near-zero emissions whilst reducing dependence on imported oil and curtailment of renewable generation. However, the technologies face very difficult challenges, in terms of cost, performance and policy. Buses, trains, PHB bicycles, canal boats, cargo bikes, golf carts, motorcycles, wheelchairs, ships, airplanes, submarines, and rockets can already run on hydrogen, in various forms. NASA used hydrogen to launch Space Shuttles into space. A working toy model car runs on solar power, using a regenerative fuel cell to store energy in the form of hydrogen and oxygen gas. It can then convert the fuel back into water to release the solar energy. BMW's Clean Energy internal combustion hydrogen car has more power and is faster than hydrogen fuel cell electric cars. A limited series production of the 7 Series Saloon was announced as commencing at the end of 2006. A BMW hydrogen prototype (H2R) using the driveline of this model broke the speed record for hydrogen cars at 300 km/h (186 mi/h), making automotive history. Mazda has developed Wankel engines to burn hydrogen. The Wankel uses a rotary principle of operation, so the hydrogen burns in a different part of the engine from the intake. This reduces pre-detonation, a problem with hydrogen fueled piston engines. The other major car companies like Daimler, Chrysler, Honda, Toyota, Ford and General Motors, are investing in hydrogen fuel cells instead. VW, Nissan, and Hyundai/Kia also have fuel cell vehicle prototypes on the road. In addition, transit agencies across the globe are running prototype fuel cell buses. Fuel cell vehicles, such as the new Honda Clarity, can get up to 70 miles (110 km) on a kilogram of hydrogen. The Hyundai ix35 FCEV fuel cell vehicle is available for lease in the U.S. In 2014, a total of 54 units were leased. Sales of the Toyota Mirai to government and corporate customers began in Japan on December 15, 2014. Toyota delivered the first market placed Mirai to the Prime Minister's Official Residence and announced it got 1,500 orders in Japan in one month after sales began against a sales target of 400 for 12 months. Deliveries to retail customers began in California in October 2015. A total of 57 units were delivered between October and November 2015. Toyota scheduled to release the Mirai in the Northeastern States in the first half of 2016. The market launch in Europe is slated for September 2015. Liquid nitrogen (LN2) is a method of storing energy. Energy is used to liquefy air, and then LN2 is produced by evaporation, and distributed. LN2 is exposed to ambient heat in the car and the resulting nitrogen gas can be used to power a piston or turbine engine. The maximum amount of energy that can be extracted from LN2 is 213 Watt-hours per kg (W·h/kg) or 173 W·h per liter, in which a maximum of 70 W·h/kg can be utilized with an isothermal expansion process. Such a vehicle with a 350-liter (93 gallon) tank can achieve ranges similar to a gasoline powered vehicle with a 50-liter (13 gallon) tank. Theoretical future engines, using cascading topping cycles, can improve this to around 110 W·h/kg with a quasi-isothermal expansion process. The advantages are zero harmful emissions and superior energy densities compared to a Compressed-air vehicle as well as being able to refill the tank in a matter of minutes. Liquefied natural gas is natural gas that has been cooled to a point at which it becomes a cryogenic liquid. In this liquid state, natural gas is more than 2 times as dense as highly compressed CNG. LNG fuel systems function on any vehicle capable of burning natural gas. Unlike CNG, which is stored at high pressure (typically 3000 or 3600 psi) and then regulated to a lower pressure that the engine can accept, LNG is stored at low pressure (50 to 150 psi) and simply vaporized by a heat exchanger before entering the fuel metering devices to the engine. Because of its high energy density compared to CNG, it is very suitable for those interested in long ranges while running on natural gas. In the United States, the LNG supply chain is the main thing that has held back this fuel source from growing rapidly. The LNG supply chain is very analogous to that of diesel or gasoline. First, pipeline natural gas is liquefied in large quantities, which is analogous to refining gasoline or diesel. Then, the LNG is transported via semi trailer to fuel stations where it is stored in bulk tanks until it is dispensed into a vehicle. CNG, on the other hand, requires expensive compression at each station to fill the high-pressure cylinder cascades. A propane-fueled school bus in the United States. LPG or liquefied petroleum gas is a low pressure liquefied gas mixture composed mainly of propane and butane which burns in conventional gasoline combustion engines with less CO2 than gasoline. Gasoline cars can be retrofitted to LPG aka Autogas and become bifuel vehicles as the gasoline tank stays. You can switch between LPG and gasoline during operation. Estimated 10 million vehicles running worldwide. There are 17.473 million LPG powered vehicles worldwide as of December 2010, and the leading countries are Turkey (2.394 million vehicles), Poland (2.325 million), and South Korea (2.3 million). In the U.S., 190,000 on-road vehicles use propane, and 450,000 forklifts use it for power. Whereas it is banned in Pakistan(DEC 2013) as it is considered a risk to public safety by OGRA. Hyundai Motor Company began sales of the Elantra LPI Hybrid in the South Korean domestic market in July 2009. The Elantra LPI (Liquefied Petroleum Injected) is the world's first hybrid electric vehicle to be powered by an internal combustion engine built to run on liquefied petroleum gas (LPG) as a fuel. A steam car is a car that has a steam engine. Wood, coal, ethanol, or others can be used as fuel. The fuel is burned in a boiler and the heat converts water into steam. When the water turns to steam, it expands. The expansion creates pressure. The pressure pushes the pistons back and forth. This turns the driveshaft to spin the wheels forward. It works like a coal-fueled steam train, or steam boat. The steam car was the next logical step in independent transport. Steam cars take a long time to start, but some can reach speeds over 100 mph (161 km/h) eventually. The late model Doble Steam Cars could be brought to operational condition in less than 30 seconds, had high top speeds and fast acceleration, but were expensive to buy. A steam engine uses external combustion, as opposed to internal combustion. Gasoline-powered cars are more efficient at about 25–28% efficiency. In theory, a combined cycle steam engine in which the burning material is first used to drive a gas turbine can produce 50% to 60% efficiency. However, practical examples of steam engined cars work at only around 5–8% efficiency. The best known and best selling steam-powered car was the Stanley Steamer. It used a compact fire-tube boiler under the hood to power a simple two-piston engine which was connected directly to the rear axle. Before Henry Ford introduced monthly payment financing with great success, cars were typically purchased outright. This is why the Stanley was kept simple; to keep the purchase price affordable. Steam produced in refrigeration also can be use by a turbine in other vehicle types to produce electricity, that can be employed in electric motors or stored in a battery. Steam power can be combined with a standard oil-based engine to create a hybrid. Water is injected into the cylinder after the fuel is burned, when the piston is still superheated, often at temperatures of 1500 degrees or more. The water will instantly be vaporized into steam, taking advantage of the heat that would otherwise be wasted. Wood gas can be used to power cars with ordinary internal combustion engines if a wood gasifier is attached. This was quite popular during World War II in several European and Asian countries because the war prevented easy and cost-effective access to oil. Dual fuel vehicle is referred as the vehicle using two types of fuel in the same time (can be gas + liquid, gas + gas, liquid + liquid) with different fuel tank. Diesel-CNG Dual Fuel is a system using two type of fuel which are diesel and Compressed Natural Gas (CNG) at the same time. It is because of CNG need a source of ignition for combustion in diesel engine. 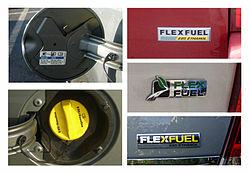 Six typical Brazilian full flex-fuel models from several carmakers, popularly known as "flex" cars, that run on any blend of ethanol and gasoline(actually between E20-E25 to E100). A flexible-fuel vehicle (FFV) or dual-fuel vehicle (DFF) is an alternative fuel automobile or light duty truck with a multifuel engine that can use more than one fuel, usually mixed in the same tank, and the blend is burned in the combustion chamber together. These vehicles are colloquially called flex-fuel, or flexifuel in Europe, or just flex in Brazil. FFVs are distinguished from bi-fuel vehicles, where two fuels are stored in separate tanks. The most common commercially available FFV in the world market is the ethanol flexible-fuel vehicle, with the major markets concentrated in the United States, Brazil, Sweden, and some other European countries. In addition to flex-fuel vehicles running with ethanol, in the US and Europe there were successful test programs with methanol flex-fuel vehicles, known as M85 FFVs, and more recently there have been also successful tests using p-series fuels with E85 flex fuel vehicles, but as of June 2008, this fuel is not yet available to the general public. Ethanol flexible-fuel vehicles have standard gasoline engines that are capable of running with ethanol and gasoline mixed in the same tank. These mixtures have "E" numbers which describe the percentage of ethanol in the mixture, for example, E85 is 85% ethanol and 15% gasoline. (See common ethanol fuel mixtures for more information.) Though technology exists to allow ethanol FFVs to run on any mixture up to E100, in the U.S. and Europe, flex-fuel vehicles are optimized to run on E85. This limit is set to avoid cold starting problems during very cold weather. The alcohol content might be reduced during the winter, to E70 in the U.S. or to E75 in Sweden. Brazil, with a warmer climate, developed vehicles that can run on any mix up to E100, though E20-E25 is the mandatory minimum blend, and no pure gasoline is sold in the country. Typical labeling used in the US to identify E85 vehicles. Top left: a small sticker in the back of the fuel filler door. Bottom left: the bright yellow gas cap used in newer models. E85 Flexfuel badging used in newer models from Chrysler (top right), Ford (middle right) and GM (bottom right). By contrast, automakers selling FFVs in Brazil commonly affix badges advertising the car as a flex-fuel vehicle. As of 2007, new FFV models sold in the U.S. were required to feature a yellow gas cap emblazoned with the label "E85/gasoline", in order to remind drivers of the cars' flex-fuel capabilities. Use of E85 in the U.S. is also affected by the relatively low number of E85 filling stations in operation across the country, with just over 1,750 in August 2008, most of which are concentrated in the Corn Belt states, led by Minnesota with 353 stations, followed by Illinois with 181, and Wisconsin with 114. By comparison, there are some 120,000 stations providing regular non-ethanol gasoline in the United States alone. US E85FlexFuel Chevrolet Impala LT 2009. There have been claims that American automakers are motivated to produce flex-fuel vehicles due to a loophole in the Corporate Average Fuel Economy (CAFE) requirements, which gives the automaker a "fuel economy credit" for every flex-fuel vehicle sold, whether or not the vehicle is actually fueled with E85 in regular use. This loophole allegedly allows the U.S. auto industry to meet CAFE fuel economy targets not by developing more fuel-efficient models, but by spending between US$100 and US$200 extra per vehicle to produce a certain number of flex-fuel models, enabling them to continue selling less fuel-efficient vehicles such as SUVs, which netted higher profit margins than smaller, more fuel-efficient cars. In the United States, E85 FFVs are equipped with sensor that automatically detect the fuel mixture, signaling the ECU to tune spark timing and fuel injection so that fuel will burn cleanly in the vehicle's internal combustion engine. Originally, the sensors were mounted in the fuel line and exhaust system; more recent models do away with the fuel line sensor. Another feature of older flex-fuel cars is a small separate gasoline storage tank that was used for starting the car on cold days, when the ethanol mixture made ignition more difficult. The Honda CG 150 Titan Mix was the first flex-fuel motorcycle launched to the market in the world. Modern Brazilian flex-fuel technology enables FFVs to run an any blend between E20-E25 gasohol and E100 ethanol fuel, using a lambda probe to measure the quality of combustion, which informs the engine control unit as to the exact composition of the gasoline-alcohol mixture. This technology, developed by the Brazilian subsidiary of Bosch in 1994, and further improved and commercially implemented in 2003 by the Italian subsidiary of Magneti Marelli, is known as "Software Fuel Sensor". The Brazilian subsidiary of Delphi Automotive Systems developed a similar technology, known as "Multifuel", based on research conducted at its facility in Piracicaba, São Paulo. This technology allows the controller to regulate the amount of fuel injected and spark time, as fuel flow needs to be decreased to avoid detonation due to the high compression ratio (around 12:1) used by flex-fuel engines. The first flex motorcycle was launched by Honda in March 2009. Produced by its Brazilian subsidiary Moto Honda da Amazônia, the CG 150 Titan Mix is sold for around US$2,700. Because the motorcycle does not have a secondary gas tank for a cold start like the Brazilian flex cars do, the tank must have at least 20% of gasoline to avoid start up problems at temperatures below 15 °C (59 °F). The motorcycle’s panel includes a gauge to warn the driver about the actual ethanol-gasoline mix in the storage tank. A hybrid vehicle uses multiple propulsion systems to provide motive power. The most common type of hybrid vehicle is the gasoline-electric hybrid vehicles, which use gasoline (petrol) and electric batteries for the energy used to power internal-combustion engines (ICEs) and electric motors. These motors are usually relatively small and would be considered "underpowered" by themselves, but they can provide a normal driving experience when used in combination during acceleration and other maneuvers that require greater power. The Toyota Prius is the world's best-selling hybrid electric vehicle, with global sales of almost 4 million units through January 2017. The Toyota Prius first went on sale in Japan in 1997 and it is sold worldwide since 2000. By 2017 the Prius is sold in more than 90 countries and regions, with Japan and the United States as its largest markets. In May 2008, global cumulative Prius sales reached the 1 million units, and by September 2010, the Prius reached worldwide cumulative sales of 2 million units, and 3 million units by June 2013. As of January 2017[update], global hybrid sales are led by the Prius family, with cumulative sales of 6.0361 million units, excluding its plug-in hybrid variant. The Toyota Prius liftback is the leading model of the Toyota brand with cumulative sales of 3.985 million units, followed by the Toyota Aqua/Prius c, with global sales of 1.380 million units, the Prius v/α/+ with 671,200, the Camry Hybrid with 614,700 units, the Toyota Auris with 378,000 units, and the Toyota Yaris Hybrid with 302,700. The best-selling Lexus model is the Lexus RX 400h/RX 450h with global sales of 363,000 units. The Honda Insight is a two-seater hatchback hybrid automobile manufactured by Honda. 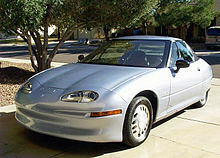 It was the first mass-produced hybrid automobile sold in the United States, introduced in 1999, and produced until 2006. Honda introduced the second-generation Insight in Japan in February 2009, and the new Insight went on sale in the United States on April 22, 2009. Honda also offers the Honda Civic Hybrid since 2002. As of January 2017[update], there are over 50 models of hybrid electric cars available in several world markets, with more than 12 million hybrid electric vehicles sold worldwide since their inception in 1997. As of April 2016[update], Japan ranked as the market leader with more than 5 million hybrids sold, followed by the United States with cumulative sales of over 4 million units since 1999, and Europe with about 1.5 million hybrids delivered since 2000. Japan has the world's highest hybrid market penetration. By 2013 the hybrid market share accounted for more than 30% of new standard passenger car sold, and about 20% new passenger vehicle sales including kei cars. The Netherlands ranks second with a hybrid market share of 4.5% of new car sales in 2012. As of January 2017[update], global sales are by Toyota Motor Company with more than 10 million Lexus and Toyota hybrids sold, followed by Honda Motor Co., Ltd. with cumulative global sales of more than 1.35 million hybrids as of June 2014[update]; Ford Motor Corporation with over 424 thousand hybrids sold in the United States through June 2015, of which, around 10% are plug-in hybrids; Hyundai Group with cumulative global sales of 200 thousand hybrids as of March 2014[update], including both Hyundai Motors and Kia Motors hybrid models; and PSA Peugeot Citroën with over 50,000 diesel-powered hybrids sold in Europe through December 2013. The Elantra LPI Hybrid, launched in the South Korean domestic market in July 2009, is a hybrid vehicle powered by an internal combustion engine built to run on liquefied petroleum gas (LPG) as a fuel. The Elantra PLI is a mild hybrid and the first hybrid to adopt advanced lithium polymer (Li–Poly) batteries. 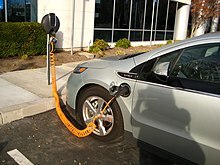 Until 2010 most plug-in hybrids on the road in the U.S. were conversions of conventional hybrid electric vehicles, and the most prominent PHEVs were conversions of 2004 or later Toyota Prius, which have had plug-in charging and more batteries added and their electric-only range extended. Chinese battery manufacturer and automaker BYD Auto released the F3DM to the Chinese fleet market in December 2008 and began sales to the general public in Shenzhen in March 2010. General Motors began deliveries of the Chevrolet Volt in the U.S. in December 2010. Deliveries to retail customers of the Fisker Karma began in the U.S. in November 2011. The Chevrolet Volt/Opel Ampera family is the world's top selling plug-in hybrid. Global sales passed the 100,000 unit milestone in October 2015. During 2012, the Toyota Prius Plug-in Hybrid, Ford C-Max Energi, and Volvo V60 Plug-in Hybrid were released. The following models were launched during 2013 and 2015: Honda Accord Plug-in Hybrid, Mitsubishi Outlander P-HEV, Ford Fusion Energi, McLaren P1 (limited edition), Porsche Panamera S E-Hybrid, BYD Qin, Cadillac ELR, BMW i3 REx, BMW i8, Porsche 918 Spyder (limited production), Volkswagen XL1 (limited production), Audi A3 Sportback e-tron, Volkswagen Golf GTE, Mercedes-Benz S 500 e, Porsche Cayenne S E-Hybrid, Mercedes-Benz C 350 e, BYD Tang, Volkswagen Passat GTE, Volvo XC90 T8, BMW X5 xDrive40e, Hyundai Sonata PHEV, and Volvo S60L PHEV. As of December 2015[update], about 500,000 highway-capable plug-in hybrid electric cars had been sold worldwide since December 2008, out of total cumulative global sales of 1.2 million light-duty plug-in electric vehicles. As of December 2016[update], the Volt/Ampera family of plug-in hybrids, with combined sales of about 134,500 units is the top selling plug-in hybrid in the world. Ranking next are the Mitsubishi Outlander P-HEV with about 119,500, and the Toyota Prius Plug-in Hybrid with almost 78,000. In very small vehicles, the power demand decreases, so human power can be employed to make a significant improvement in battery life. Two such commercially made vehicles are the Sinclair C5 and TWIKE. Different fuel pathways require different amounts of energy to drive 100 km. From left to right: Coal to electricity to electrical car. Renewable energy (e.g. wind or photovoltaics) to electrical car. Renewable energy to hydrogen to hydrogen-powered car. Petroleum to diesel to internal combustion engine. According to a recent comparative energy and environmental analysis of the vehicle fuel end use (petroleum and natural gas derivatives & hydrogen; biofuels like ethanol or biodiesel, and their mixtures; as well as electricity intended to be used in plug-in electric vehicles), the renewable and non-renewable unit energy costs and CO2 emission cost are suitable indicators for assessing the renewable energy consumption intensity and the environmental impact, and for quantifying the thermodynamic performance of the transportation sector. This analysis allows ranking the energy conversion processes along the vehicle fuels production routes and their end-use, so that the best options for the transportation sector can be determined and better energy policies may be issued. Thus, if a drastic CO2 emissions abatement of the transportation sector is pursued, a more intensive utilization of ethanol in the Brazilian transportation sector mix is advisable. However, as the overall exergy conversion efficiency of the sugar cane industry is still very low, which increases the unit energy cost of ethanol, better production and end-use technologies are required. Nonetheless, with the current scenario of a predominantly renewable Brazilian electricity mix, based on more than 80% of renewable sources, this source consolidates as the most promising energy source to reduce the large amount of greenhouse gas emissions which transportation sector is responsible for. ^ a b c d e f g h i j k "Worldwide Sales of Toyota Hybrids Surpass 10 Million Units" (Press release). Toyota City, Japan: Toyota. 2017-01-14. Retrieved 2017-01-15. This latest milestone of 10 million units was achieved just nine months after total sales reached 9 million units at the end of April 2016. ^ a b c d Cobb, Jeff (2017-01-31). "Tesla Model S Is World's Best-Selling Plug-in Car For Second Year In A Row". HybridCars.com. Retrieved 2017-01-31. See also detailed 2016 sales and cumulative global sales in the two graphs. ^ "Revealed - how the hybrid car "works" | Claverton Group". Claverton-energy.com. 2009-02-24. Retrieved 2010-12-12. ^ Cobb, Jeff (2017-01-16). "The World Just Bought Its Two-Millionth Plug-in Car". HybridCars.com. Retrieved 2017-01-17. ^ a b c Giovanna Riato (2015-07-07). "Motores flex precisam de mais eficiência" [Flex engines require more efficiency] (in Portuguese). Automotive Business. Retrieved 2015-08-26. ^ a b c d Staff (2015-03-09). "Honda chega a 4 milhões de Motos Flex Produzidas no Brasil" [Honda reaches 4 million flexible-fuel motorcycles produced in Brazil] (in Portuguese). Revista Auto Esporte. Retrieved 2015-08-26. ^ a b Brian Milne (2014-12-07). "Chicago Ethanol Stubbornly Holding Premium to Gasoline". Schneider Electric. Retrieved 2015-08-26. ^ a b BAFF. "Bought ethanol cars". BioAlcohol Fuel Foundation. Archived from the original on 21 July 2011. Retrieved 2013-11-17. As of September 2013, see Graph "Bought flexifuel vehicles"
^ a b "Worldwide NGV Statistics". NGV Journal. Retrieved 2013-11-17. ^ a b c d Cobb, Jeff (2016-06-06). "Americans Buy Their Four-Millionth Hybrid Car". HybridCars.com. Retrieved 2016-06-12. ^ a b Honda Press Release (2012-10-15). "Cumulative worldwide sales of Honda hybrids passes 1 million units". Green Car Congress. Retrieved 2012-10-16. ^ a b Roger Schreffler (2014-07-14). "Toyota Strengthens Grip on Japan EV, Hybrid Market". Ward's AutoWorld. Archived from the original on 2014-05-02. Retrieved 2014-04-30. Honda sold 187,851 hybrids in 2013. ^ a b Roger Schreffler (2014-08-20). "Toyota Remains Unchallenged Global Hybrid Leader". Ward's AutoWorld. Archived from the original on 2014-10-09. Retrieved 2014-10-04. Honda sold 158,696 hybrids during the first six months of 2014. ^ a b "Anúario da Industria Automobilistica Brasileira 2011: Tabela 2.3 Produção por combustível - 1957/2010" (in Portuguese). ANFAVEA - Associação Nacional dos Fabricantes de Veículos Automotores (Brasil). Retrieved 2012-01-22. pp. 62–63. ^ Alfred Szwarc. "Abstract: Use of Bio-fuels in Brazil" (PDF). United Nations Framework Convention on Climate Change. Archived (PDF) from the original on 11 November 2009. Retrieved 2009-10-24. ^ Luiz A. Horta Nogueira (2004-03-22). "Perspectivas de un Programa de Biocombustibles en América Central: Proyecto Uso Sustentable de Hidrocarburos" (PDF) (in Spanish). Comisión Económica para América Latina y el Caribe (CEPAL). Archived from the original (PDF) on 28 May 2008. Retrieved 2008-05-09. ^ UNICA, Brazil (October 2012). "Frota brasileira de autoveículos leves (ciclo Otto)" [Brazilian fleet of light vehicles (Otto cycle)] (in Portuguese). UNICA Data. Retrieved 2012-10-31. ^ Posawatz, Tony (2018-10-01). "Victory In The Electric Car Market Will Go To Whoever Creates A Smartphone-Like Ecosystem". Forbes. Retrieved 2018-10-24. ^ "Nissan strengthens Formula E partnership with stake in e.dams" (Press release). Yokohama: Nissan. 2018-09-12. Retrieved 2018-10-24. ^ a b Automotive News China (2018-10-19). "China's electrified vehicle fleet tops 2.21 million". Automotive News China. Retrieved 2018-10-24. China’s fleet of electric vehicles and plug-in hybrids topped 2.21 million by the end of September as sales of electrified vehicles continued to surge in the country. Of the total, EVs accounted for 1.78 million, or nearly 81 percent. The rest were plug-in hybrids, China’s Ministry of Public Security said this week. Electrified cargo vehicles -- which include trucks, pickups and delivery vans -- approached 254,000, representing 11 percent of the electrified vehicle fleet as of last month. ^ Kane, Mark (2018-10-06). "Plug-In Electric Cars Sales In U.S. Surpass 1 Million". InsideEVs.com. Retrieved 2018-10-23. ^ "Electric cars exceed 1m in Europe as sales soar by more than 40%". The Guardian. 2018-08-26. Retrieved 2018-10-23. ^ Norsk Elbilforening (Norwegian Electric Vehicle Association) (October 2018). "Norwegian EV market". Norsk Elbilforening. Retrieved 2018-10-24. Place the pointing device over the graph to show the cumulative number of electric vehicles and plug-in hybrids in Norway at the end of each year. As of 30 September 2018[update], the registered light-duty plug-in electric stock totaled 273,559 units, consisting of 183,637 battery electric vehicles and 89,922 plug-in hybrids. ^ International Energy Agency (IEA), Clean Energy Ministerial, and Electric Vehicles Initiative (EVI) (May 2016). "Global EV Outlook 2016: Beyond one million electric cars" (PDF). IEA Publications. Retrieved 2016-08-31. CS1 maint: Multiple names: authors list (link) See pp. 4–5, and 24–25 and Statistical annex, pp. 34–37. ^ a b c Cobb, Jeff (2017-01-09). "Nissan's Quarter-Millionth Leaf Means It's The Best-Selling Plug-in Car In History". HybridCars.com. Retrieved 2017-01-10. As of December 2016[update], the Nissan Leaf is the world's best-selling plug-in car in history with more than 250,000 units delivered, followed by the Tesla Model S with over 158,000 sales (which may soon replace the Nissan Leaf in most EV sales), the Volt/Ampera family of vehicles with 134,500 vehicles sold, and the Mitsubishi Outlander PHEV with about 116,500 units sold through November 2016. These are the only plug-in electric cars so far with over 100,000 global sales. ^ "Plug-in Vehicle Tracker: What's Coming, When". Plug In America. Retrieved 2012-01-15. ^ "nycomb.se, Nycomb Chemicals company". Archived from the original on 3 June 2008. Retrieved 26 July 2017. ^ Semelsberger, Troy A; Borup, Rodney L; Greene, Howard L (2006). "Dimethyl ether (DME) as an alternative fuel". Journal of Power Sources. 156 (2): 497–511. doi:10.1016/j.jpowsour.2005.05.082. Retrieved 30 May 2015. ^ "BioDME". Retrieved 30 May 2015. ^ "Biofuels in the European Union, 2006" (PDF). Retrieved 26 July 2017. ^ "Volvo Group - Driving prosperity through transport solutions". Retrieved 26 July 2017. ^ "Chemrec press release September 9, 2010" (PDF). Archived from the original (PDF) on 12 June 2017. Retrieved 26 July 2017. ^ a b "Ammonia as a Transportation Fuel IV" (PDF). Norm Olson – Iowa Energy Center. 15–16 October 2007. Archived from the original (PDF) on 2012-02-07. ^ "Iowa Energy Center, Renewable Energy and Energy Efficiency; Research, Education and Demonstration – Related Renewable Energy – Ammonia 2007". Archived from the original on 2012-03-18. ^ "Ammonia Motors". 1 October 2007. Retrieved 28 November 2010. ^ "Watch 'Hydrofuel Inc. Update' and 'Hydrofuel NH3 Car Featured on HardDrive'". Hydrofuel Inc.
^ a b Green NH3. "Greennh3.com". Greennh3.com. Archived from the original on 28 October 2010. Retrieved 2010-12-12. ^ "Ethanol: Introduction". Journey to Forever. Archived from the original on 10 August 2008. Retrieved 2008-08-11. ^ a b c d e f Goettemoeller, Jeffrey; Adrian Goettemoeller (2007). "Sustainable Ethanol: Biofuels, Biorefineries, Cellulosic Biomass, Flex-Fuel Vehicles, and Sustainable Farming for Energy Independence". Prairie Oak Publishing, Maryville, Missouri: 56–61. ISBN 978-0-9786293-0-4. ^ a b c d e Roberta J Nichols (2003). "The Methanol Story: A Sustainable Fuel for the Future" (PDF). Methanol Institute. Archived from the original (PDF) on 2008-12-11. Retrieved 2008-08-30. ^ "Another Inconvenient Truth" (PDF). Oxfam. 2008-06-28. Archived from the original (PDF) on 19 August 2008. Retrieved 2008-08-06. Oxfam Briefing Paper 114. ^ Timothy Searchinger; et al. (2008-02-29). "Use of U.S. Croplands for Biofuels Increases Greenhouse Gases Through Emissions from Land-Use Change". Science. 319 (5867): 1238–1240. doi:10.1126/science.1151861. PMID 18258860. Archived from the original on 12 May 2008. Retrieved 2008-05-09. Originally published online in Science Express on 7 February 2008. See Letters to Science by Wang and Haq. There are critics to these findings for assuming a worst-case scenario. ^ Ethanol Promotion and Information Council (2007-02-27). "When is E85 not 85 percent ethanol? When it's E70 with an E85 sticker on it". AutoblogGreen. Retrieved 2008-08-19. ^ "EPA Mileage". Fueleconomy.gov. Archived from the original on 3 December 2010. Retrieved 2010-12-12. ^ "Reported E85 Prices-Last 30 days". E85prices.com. Archived from the original on 12 September 2008. Retrieved 2008-09-18. ^ Reuters (2008-08-06). "Vendas de veículos flex no Brasil sobem 31,1% em julho 2008" (in Portuguese). Hoje Notícias. Archived from the original on 2009-02-01. Retrieved 2008-08-13. ^ "Veículos flex somam 6 milhões e alcançam 23% da frota" (in Portuguese). Folha Online. 2008-08-04. Retrieved 2008-08-12. ^ "DENATRAN Frota por tipo/UF 2008 (file 2008-03)" (in Portuguese). Departamento Nacional de Trânsito. Retrieved 2008-05-03. [permanent dead link] As of March 31, 2008, DENATRAN reports a total fleet of 50 million, including motorcycles, trucks and special equipment, and 32 million automobiles and light commercial vehicles. ^ a b Inslee, Jay; Bracken Hendricks (2007). "Apollo's Fire". Island Press, Washington, D.C.: 153–155, 160–161. ISBN 978-1-59726-175-3. See Chapter 6. Homegrown Energy. ^ Norman, Jim. "Where There’s Never an Oil Shortage". The New York Times. May 13, 2007. ^ Tillman, Adriane. "Greasestock Festival returns, bigger and better Archived 2008-05-18 at the Wayback Machine". May 14, 2008. ^ "Greasestock 2008". Greasestock. Retrieved May 20, 2008. ^ Max, Josh. "Gas-guzzlers become veggie delights at Greasestock in Yorktown Heights". Daily News. May 13, 2008. ^ a b "Bio-methane fuelled vehicles - John Baldwin CNG Services | Claverton Group". Claverton-energy.com. Retrieved 2010-12-12. ^ a b Sperling, Daniel; Deborah Gordon (2009). "Two billion cars: driving toward sustainability". Oxford University Press, New York: 93–94. ISBN 978-0-19-537664-7. ^ a b "Current Natural Gas Vehicle Statistics". International Association for Natural Gas Vehicles. Retrieved 2013-11-17. Click on Ranked by number. ^ "Pakistan Hits One-Million Natural Gas Vehicle Mark". Green Car Congres. 2006-05-13. Retrieved 2008-10-17. ^ "Team FAST - Building the world's first bus on formic acid". Team FAST. Retrieved 26 July 2017. ^ "Team FAST presents scale model of car powered by formic acid". tue.nl. Retrieved 26 July 2017. ^ Jeff Cobb (2014-11-17). "Toyota Mirai To Be Priced From $57,500". HybridCars.com. Retrieved 2014-11-19. ^ Honda Motor Company (16 June 2008). "Honda Announces First FCX Clarity Customers and World's First Fuel Cell Vehicle Dealership Network as Clarity Production Begins". Archived from the original on 14 August 2009. Retrieved 2009-06-01. ^ "Hydrogen fuel cells to hit showrooms by 2013". Collision Repair Magazine. Archived from the original on 7 November 2014. Retrieved 30 May 2015. ^ John Voelcker (2014-07-29). "Honda Ends Three Green Models For 2015: Insight, Fit EV, FCX Clarity". Green Car Reports. Retrieved 2014-08-20. ^ "Hydrogen for transport", The Carbon Trust, 28 November 2014. Retrieved on 20 January 2015. ^ Thames & Kosmos kit Archived July 12, 2012, at the Wayback Machine, Other educational materials, and many more demonstration car kits Archived December 26, 2007, at the Wayback Machine. ^ Yoko Kubota (2014-12-15). "Toyota's Fuel-Cell Car Mirai Goes on Sale". Japan Real Time (Wall Street Journall). Retrieved 2014-12-29. ^ Mihalascu, Dan (2015-01-15). "Toyota Gets 1,500 Orders for the Mirai in Japan in One Month". Car Scoops. ^ John Voelcker (2015-12-14). "Portable Hydrogen Fuelers Go To Six Toyota Mirai Dealers As Stations Lag". Green Car Reports. Retrieved 2015-12-18. ^ John Voelcker (2014-11-18). "2016 Toyota Mirai Priced At $57,500, With $499 Monthly Lease". Green Car Reports. Retrieved 2014-11-19. ^ "Propane FAQ". Retrieved 2011-04-25. ^ a b "Hyundai Elantra LPi hybrid official press release". Hyundai. 2009-07-10. Archived from the original on 2009-07-17. Retrieved 2010-03-23. ^ Clean Cities (June 2008). "Flexible Fuel Vehicles: Providing a Renewable Fuel Choice (Fact Sheet)" (PDF). U.S. Department of Energy. Retrieved 2008-08-24. ^ Ryan, Lisa; Turton, Hal (2007). Sustainable Automobile Transport. Edward Elgar Publishing Ltd, England. pp. 40–41. ISBN 978-1-84720-451-6. ^ Ken Thomas (2007-05-07). "'Flex-fuel' vehicles touted". USA Today. Retrieved 2008-09-15. ^ National Ethanol Vehicle Coalition (2008-09-08). "New E85 Stations". NEVC FYI Newsletter (Vol 14 issue 15). Archived from the original on 15 September 2008. Retrieved 2008-09-15. ^ "2002 Economic Census: Retail Trade - United States". Census.gov. Retrieved 2010-12-12. ^ "As buyers shun SUVs, expect to pay more for that small car - Cleveland Business News". Blog.cleveland.com. Retrieved 2010-12-12. ^ "Bumpy ride for biofuels". The Economist. 2008-01-18. Archived from the original on 27 October 2008. Retrieved 2008-09-14. ^ Agencia EFE (2003-03-11). "Honda lançará moto flex ainda neste mês no Brasil" (in Portuguese). Folha Online. Retrieved 2003-03-11. ^ "Honda lança no Brasil primeira moto flex do mundo" (in Portuguese). UNICA. 2003-03-11. Archived from the original on 2012-06-29. Retrieved 2003-03-11. ^ a b Reese Ewing; Lisa Shumaker (2009-04-29). "Motorcycle joins Brazil's biofueled fleet". Reuters. Retrieved 2009-04-30. ^ "Honda lança primeira moto bicombustível do mundo" (in Portuguese). G1 Portal de Notícias da Globo. 2008-03-11. Archived from the original on 2012-02-24. Retrieved 2003-03-11. ^ a b "Worldwide Prius Cumulative Sales Top 2M Mark; Toyota Reportedly Plans Two New Prius Variants for the US By End of 2012". Green Car Congress. 2010-10-07. Archived from the original on 11 October 2010. Retrieved 2010-10-07. ^ Toyota Europe News (2013-07-03). "Worldwide Prius sales top 3-million mark; Prius family sales at 3.4 million". Green Car Congress. Retrieved 2013-07-03. ^ James B. Treece; Lindsay Chappell (2006-05-17). "Honda Kills the Insight". AutoWeek. Retrieved 2008-01-10. ^ "2017 Honda Accord Hybrid - Honda". Honda Automobiles. Retrieved 26 July 2017. ^ "Honda Insight: America's most affordable hybrid at $19,800". Honda. Motor Authority. 2009-03-10. Archived from the original on 14 March 2009. Retrieved 2009-03-21. ^ International Council on Clean Transportation (ICCT) (2013). "European Vehicle Market Statistics - Pocketbook 2013" (PDF). ICCT. Retrieved 2015-01-24. See Figure 1.3, pp 6. See also tables in pp. 88–110 for HEV market by country from 2001 to 2012. ^ "50,000 Diesel Hybrid Vehicles Sold in Europe by PSA Peugeot Citroën". Reuters. 2014-01-10. Retrieved 2014-10-04. ^ Bichlien Hoang. "Plug-In Hybrid Electric Vehicles (PHEVs): Overview". Institute of Electrical and Electronics Engineers. Retrieved 2010-03-05. ^ Crippen, A. (December 15, 2008) "Warren Buffett's Electric Car Hits the Chinese Market, But Rollout Delayed For U.S. & Europe" CNBC. Retrieved December 2008. ^ Balfour, F. (December 15, 2008)"China's First Plug-In Hybrid Car Rolls Out" Business Week. Retrieved December 2008. ^ "BYD F3DM Plug-in Hybrid Goes On Sale in China". Green Car Congress. 2008-12-15. Retrieved 2009-02-28. ^ "BYD Auto To Begin Sales of F3DM Plug-in to Individuals". Green Car Congress. 2010-03-23. Retrieved 2010-03-27. ^ "BYD Auto to Offer F3DM Plug-in Hybrid to Chinese Individuals Starting Next Week". Edmunds.com. 2010-03-23. Archived from the original on 2010-03-30. Retrieved 2010-03-27. ^ Jeff Cobb (2015-11-04). "GM Sells Its 100,000th Volt in October". HybridCars.com. Archived from the original on 2015-11-08. Retrieved 2015-11-04. About 102,000 units of the Volt/Ampera family have been sold worldwide by the end of October 2015. ^ Flórez-Orrego, Daniel (2015). "Exergy and environmental comparison of the end use of vehicle fuels: The Brazilian case". Energy Conversion and Management. 100: 220–231. doi:10.1016/j.enconman.2015.04.074. Retrieved 2015-05-19. Cradle-to-Grave Lifecycle Analysis of U.S. Light-Duty Vehicle-Fuel Pathways: A Greenhouse Gas Emissions and Economic Assessment of Current (2015) and Future (2025–2030) Technologies (includes estimated cost of avoided GHG emissions from different AFV technologies), Argonne National Laboratory, June 2016. Clean Cities - 2014 Vehicle Buyer's Guide, National Renewable Energy Laboratory (NREL), U.S. Department of Energy, Clean Cities program. December 2013. Popular Mechanics describes the pros and cons of various alternative fuels and what the future looks like for each. Powering Ahead - The future of low-carbon cars and fuels, the RAC Foundation and UK Petroleum Industry Association, April 2013. Questions and Answers about Trev., UniSA, Division of Information Technology, Engineering and the Environment.